Irish Setter Temperament – How To Tell If This Dog Breed Is Right For You? Blondes are known to have fun but it’s no match for the stunning Irish Setter temperament. These red-headed beauties are fun-loving and extremely smart. Native to Ireland, this sporting dog was bred as a gundog trained to hunt birds. Medium in size, the Irish Setter rounds out at about 60 to 70 pounds and two feet tall. Known for their likeability and enthusiasm, the Irish Setter dog is also athletic, and friendly. This happy-go-lucky breed has extreme drive and energy thanks to its origin as a bird dog. Though those talents aren’t utilized as often today, Irish Setters still have that hunting instinct – especially if it involves birds. Their tremendous amount of energy spills into this breeds desire to try new things and see new places. And while the Setter loves everyone, that doesn’t mean they will do well in every home. That tremendous energy can be troublesome to those who don’t have the necessary time or patience – at least one hour per day. While this breed is typically sociable and outgoing with humans and dogs, be careful with smaller animals as they can sometimes view them as prey. But, with the right introduction and some patience, they should get along just fine. When it comes to children, the Irish Setter is best in a home with older kids. Their rambunctious attitude can be a bit overwhelming to young kids who may find themselves in the crosshairs of a playful Setter! Irish Setter’s are perfect for families with a large fenced-in backyard. Or with an active family that includes their pup in all their favorite outdoor activities such as hiking, swimming, jogging, or just a walk around the park. In addition to their energetic attitude, this breed is known for their clown-like behavior – entertaining with a large sense of mischief. Life with an Irish Setter is anything but dull! When it comes to training an Irish Setter dog, patience is a virtue. Though they are extremely intelligent, they are also independent and mischievous. Coupled with the fact that Irish Setters retain a puppy mentality until they are about five years old, training can be quite the challenge. That being said, early and consistent training is the name of the game. Irish Setter’s can have a reputation of being “airheads” but if you are gentle and patient, they will be eager and willing to learn. The key is to make training fun. This breed can become stubborn if they don’t like what they are learning. 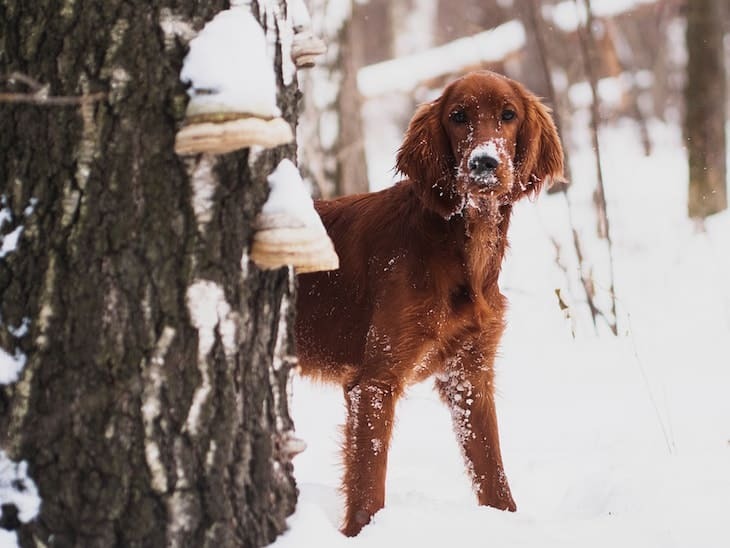 The Irish Setter breed responds best to consistent, firm, and loving training – especially if the end result is a treat, play or praise. Once this breed has learned a command or trick, they’ll never forget it – so learning the first time around will be best. For optimal results, train your Irish Setter as a puppy and don’t stop after one session. Ready to take the leap and add an Irish Setter puppy to your family? You’ve got a couple different options. One option is rescuing an Irish Setter. There are several rescue organizations dedicated to this breed. But there are also plenty of non-breed specific rescues and shelters that have Irish Setter adults and puppies available for adoption. Another option is to look for Irish Setters for sale. We cover both options below. If you’re thinking of going the rescue route, there are several Irish Setter rescues for you to choose from. The Irish Setter Club of America, for example, has a volunteer group called the “Irish Setter Rescue”. This group works tirelessly to find homes for homeless and displaced Irish Setters. Save Our Setters, Inc., is another Irish Setter rescue working to rehome displaced Setters to loving, forever homes. Additionally, the NorCal Irish Setter Rescue, Inc. is an adoption center for this breed. You can also find Irish Setter puppies or adults for adoption on sites such as Petfinder.com and Adoptapet.com. Be sure to contact your local shelter and ask if they have any Irish Setter or Irish Setter mixes available for adoptions. If you are looking for a purebred Irish Setter puppy, your first stop should be the Irish Setter Club of America, Inc. 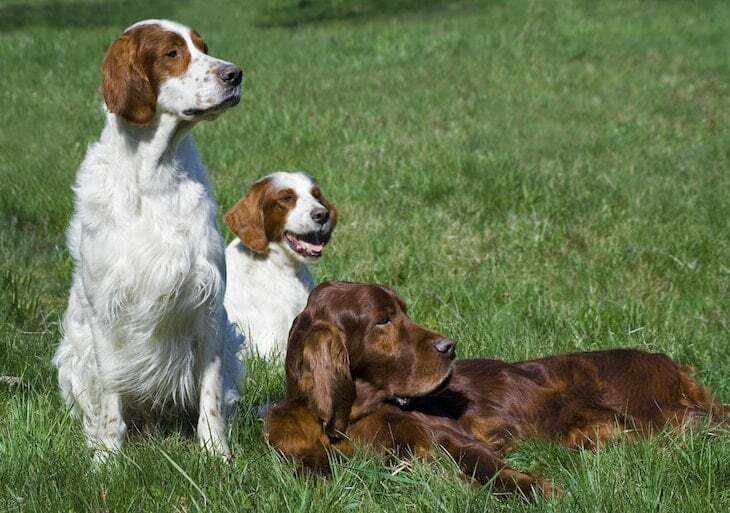 They offer an online directory of breeders listed by region based on Irish Setter puppies for sale, stud services, adults for sale, obedience work, field stock, show stock, and agility. The ISCA also offers an international breeders list. Additionally, you can search the AKC Marketplace website for Irish Setters for sale. Be advised that the average Irish Setter price can range from $1,300 to $5,000 or more depending on where you buy your puppy, availability and their lineage. 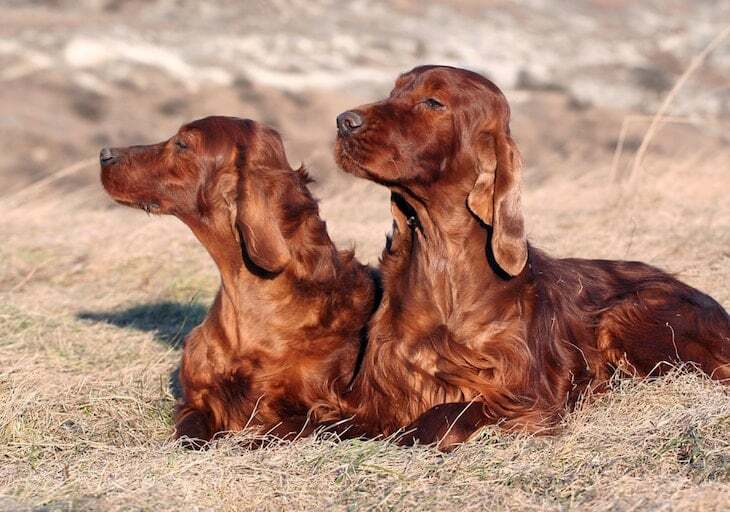 The Irish Setter is unmistakable with its feathered, silky red coat. They have fine hair on their head and front legs with long and straight hair on their body that feathers out on the back legs, tail, ears, belly, and chest. Grooming them requires brushing every other day to remove their loose hair and tangles while keeping their coat healthy and shiny. Regular brushing allows you to only bathe the Setter about twice per year – unless they enjoy playing in the dirt! Since their ears are long and hang, they are prone to ear infections. Weekly check-ups can prevent a more serious problem and a trip to the vet. Though the Irish Setter is generally healthy, they are prone to specific health conditions. This breed is prone to hip dysplasia, hypothyroidism, Osteochondrosis Dissecans (OCD – an orthopedic condition), Epilepsy, Progressive Retinal Atrophy (PRA), and Bloat (Gastric Torsion). Regular trips to your veterinarian will help prevent and catch these diseases early on. The Irish Setter is a wonderful breed with a heart of gold. They are outgoing, personable, affectionate, and playful. The Setter is energetic and requires adequate exercise. And when trained properly, make an amazing family companion. The Irish Setter temperament traits and all its other assets certainly make it a strong contender for the family dog. English Toy Terrier Temperament: Fun and Feisty Little Guys!